Melissa grew up in McAllen, TX and lived in New York, NY for the past 16 years. She has studied in many great schools such as Melba Huber School of Dance, Bill Martin Viscount’s Ballet School, The Joffrey School and Steps. Melissa performed during her career with companies such as Southwest Ballet Co., The Joffrey Ballet School, Disney Tokyo Entertainment, NY Motion, and The Radio City Rockettes for 8 years! She has been teaching all over the world for over 25 years in places such as Texas, Florida, Pennsylvania, Illinois, OCU University, New York, and Tokyo. 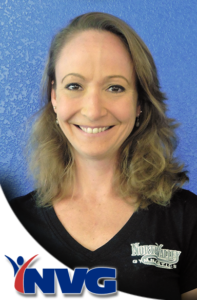 Melissa is an accomplished teacher of ballet, pointe, jazz, tap, precision dance, and gymnastics for ages 9 months to adults. Melissa is now our Devo Director for NVG! She is so excited to help our younge ladies on their road to competitive gymnastics! …. dedicating one’s life to our future dreamers!